For one of my classes next semester I am going to propose this idea. I would like to use a Computer Power supply since they are a cheaper alternative. How can I power the TEC from a computer PSU? From what I read or know right now is that a computer PSU is a constant voltage source whereas the TEC is a constant current. The computer parts I will source used to keep prices low. Any Advices on TEC selection? I want to run the TEC at full blast at 12v to cool as fast as possible so I dont think I need a PWM right? 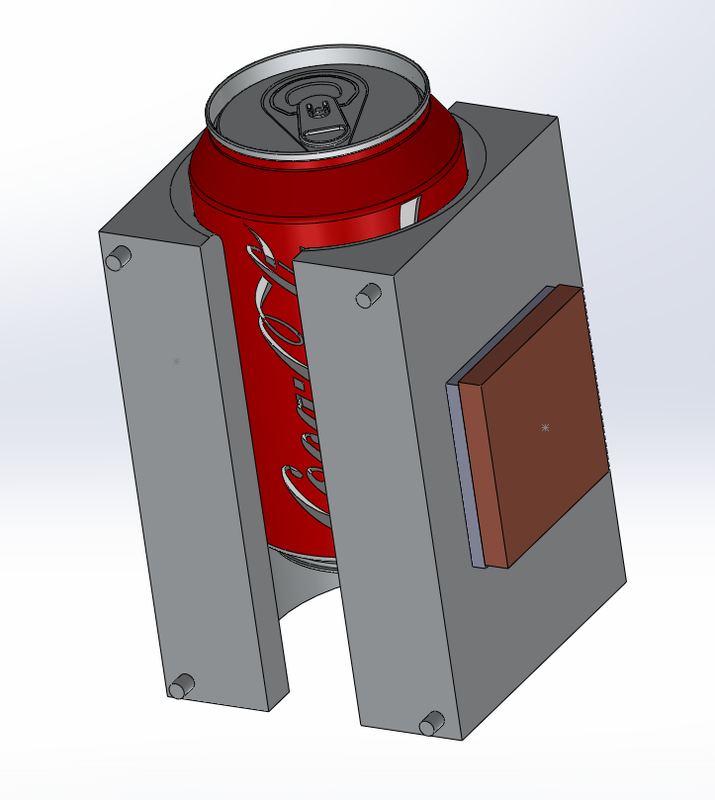 Alright, well the first problem you have is figuring out how you plan on getting a good contact with the can, without having a large surface area to allow for good thermal conduction the idea won't work. Second TEC's are semiconductors and at different temperatures they draw a slightly different current, but since you've identified which TEC you want and that you want to run it at 12v we can figure out approximately how much current it will draw. If you look on the manufacturers website you'll find a PDF: http://www.customthermoelectric.com/tecs/pdf/12711-6M31-30CZ_spec_sht.pdf with a chart showing the voltage and current. So for the purpose of these numbers we'll just pick an arbitrary delta. We're going to say that the Delta T is 40C, and the operating voltage is 12V. So according to the chart that gives us around 23A of current that the TEC will draw. So given P = IV, each TEC will draw around 276W. At the same Delta T that gives us around 88w Qmax for each TEC according to the other chart. So 88w Qmax * 2 is 176 Qmax. What this means is that you'll be able to move a maximum of 176W of energy while maintaining a 40C Delta. This means that if you can hold the hot side at a constant 25C the cold side would sit at a constant -15C. However this means you'll require a very large power supply because assuming the TECs are wired in parallel then the current is 46A. At this you'd have to use many different cables from the 12V line to be able to provide this current without burning up the wires. I wouldn't want to draw more than around 7A from a regular PSU wire. So given this value you'd need 7 or 8 different wires providing 12v in parallel to spread the 46A load safely. If you are really serious about this project, A you'll need to study a lot more about TEC cooling. Also I would recommend a dedicated external 12V PSU that you can wire up heavier gauge wire to it. In this case you'd probably need around a 600W dedicated PSU. Until you are a bit more comfortable with the exacts of how you would plan on completing such a project I wouldn't bother attempting it. At best working with TECs is fairly complicated because of design complexities and the requirement for having the ability to provide power at usually quite high currents. I would suggest before going any further that you would want to look at this guide: http://www.scribd.com/doc/16803737/Melc ... c-Handbook, it gives some more detail about TECs, how they work, and some design information. Anyways, if you do decide to go ahead with this project good luck and feel free to ask more questions. Recently my boss asked me for something that he could pay me for and would work for this class so I might focus on that instead. In any event ill let you know if I have any more questions. This site is a great Resource. Ok so I decided to try this Peltier project out. Going to use this pelt because its available the one in the OP isnt. The Interface between the Cold side and the can will be of Machine Aluminum to give as much surface area to the can. 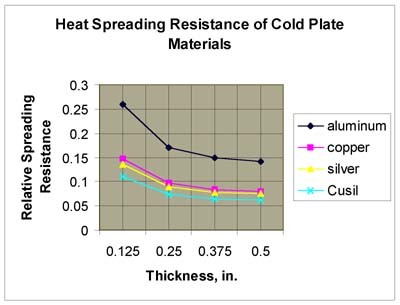 The hot side will have a Copper Hot plate of either 1/4 to 3/8th " thickness. The Heatsinks Retaining clips will provide the necessary preload (150-300 inch lbs) needed onto the pelts which I will drill and tap holes into the aluminum. Keep it up, I'll try and help as any time I can (I can't promise I'll be able to respond quickly, as I'm doing senior courses in university). I am running into a little issue with the hot side. So I need a hot plate or heat spreader. I just purchased an half inch thick piece of copper with the purpose of milling it down. I need to find the optimal thickness. but I am confused as to what I should use? I read that cold plates are used as like a shock absober to slow down how fast it can cool..ect so for hot plates I do not want it to be too thick then. But I need to make sure I can pull heat effectively from the outside area of the peltier that my water block cannot cover. I'm going to suggest since you are going with air cooling the hotplate should be fairly thin, 1/4" is probably the thinnest that I could suggest, aluminum and copper aren't particularly strong and you don't want either the coldplate or hotplate bending. The trick is both the coldplate and hotplate will add to lost energy and reduce your delta a little. So always build that in to your expectations. Also try and make sure that anything directly contacting a TEC has been lapped or is pretty darn close to flat, TECs surfaces are made of ceramic and they don't tolerate surface variation very well so lapping is a good idea.